A lot of items are needed when building an aquarium. There’s the thermometer, which helps you monitor the water temperature and ensure that it’s within the ideal range for your fish. Here is our review about best thermometer for aquarium. Unlike a thermometer or a filter, however, an air pump is not considered as a basic necessity for an aquarium. It could be necessary, but that depends on you and your fish tank. What Are Your Options? Uniclife Aquarium Air Pump 4Marina Battery-Operated Air PumpTetra Whisper Air PumpDeep Blue Professional Air PumpJVSURF Aquarium Air PumpWhat’s Our Pick? What Do Air Pumps Do? 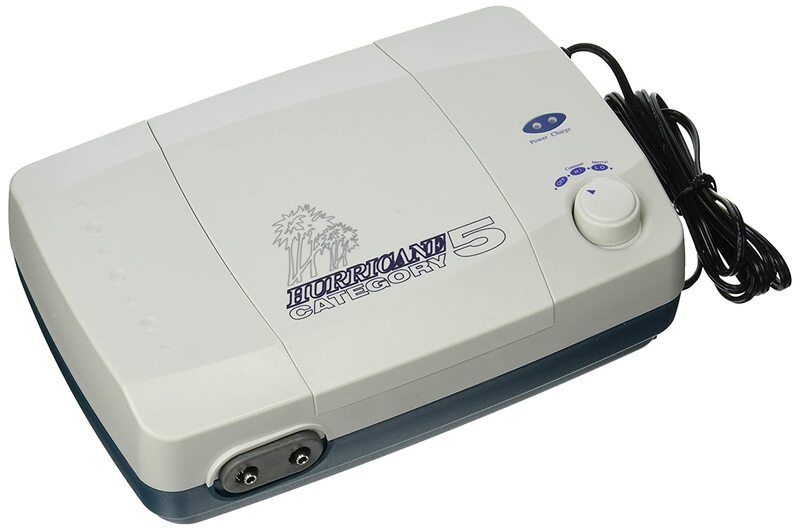 In general, air pumps can bring air from outside the aquarium to inside the aquarium through an outlet. The outlet can be in form of decoration. For example, you can arrange a coral or a plant that has bubbles coming out of its center. If you enjoy having miniature structures in your tank such as a house or a ship, you can turn their chimneys into your air pump’s outlet as well. Another option would be to use an air stone that you can hide behind plants or corals. You can also illuminate the bubbles produced by your air pump using a colorful light source to provide more aesthetic appeal. Aside from using the air pump to form bubbles for aesthetic design, however, you can also use it to provide more oxygen to your water. The more your water moves, the more contact it has with air, so more oxygen will then get into the water. The addition of an air pump is not harmful to your fish. So if you like having an additional source of oxygen or just the nice effect of the bubbles, you can definitely get one. There are also some types of filters that require the use of an air pump. An example would be an undergravel filter or a corner filter. However, for some of these types of filter, a water pump can also be used. If you use protein skimmers, an air pump would be necessary as well, especially if the skimmers use air stones to produce the foam that removes organic waste from your tank. While most air pumps come with instructions on how to install the device and its accessories, knowing the purpose of them can be extremely helpful and may give you that extra preparation you need. There are only a few accessories that you can use with an air pump. These are the tubes that you will use to connect your air pump from outside the aquarium to the ornaments or air stones inside the water. These items allow you to customize the air flow through multiple airline tubes. It is especially necessary if you want to connect the air pump to multiple ornaments or air stones. A check valve or return valve is a must for every type of air pump. It’s a device that allows air to pass in only one direction and prevents air or water from going backwards into the pump outlets. This can be useful whenever there are power outages or when the pump loses its power source, whether it’s the electricity or battery. These are used when you need more airlines than the amount supplied by the pump. It is also useful when you want to connect the air pump to various ornaments or air stones. When using gang valves, you can adjust the air flow individually to achieve your desired bubble effect from each air stone or ornament. Before getting an air pump, be aware of what accessories you might need. This mostly depends on what you intend to use the air pump for. Some of the most powerful air pumps are capable of pumping air to more than one tanks. If you’d like to do this as well, then the amount of accessories needed to accommodate multiple tanks would have to be well thought of. 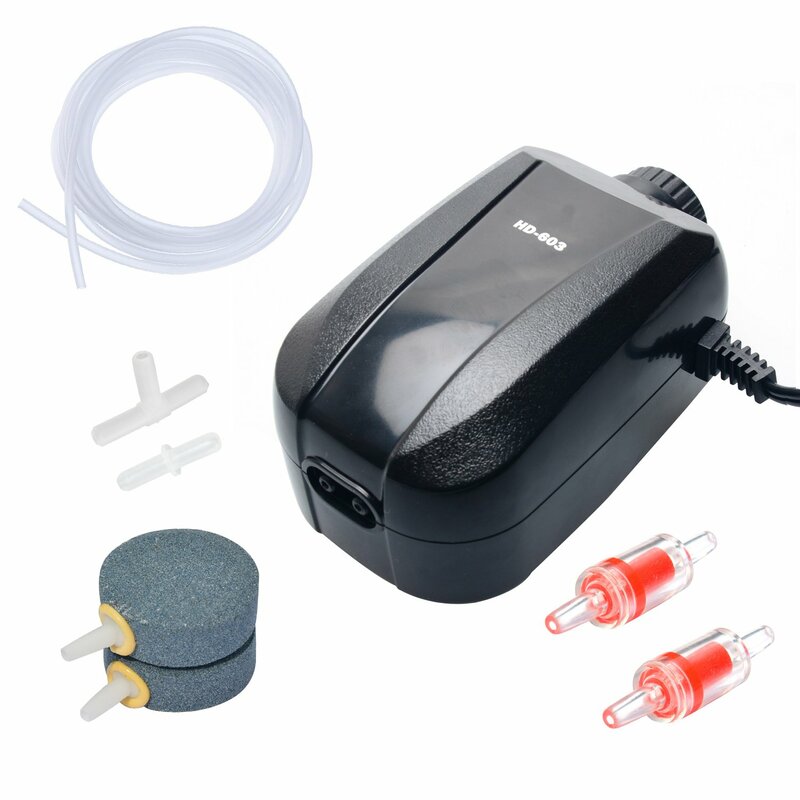 You can check if the air pump comes with these accessories before purchasing. If not, or if the amount of accessories is not enough for what you need, you can buy them separately. Most of them are inexpensive and are fairly easy to find. Some accessories are also offered to be bought together with the air pump as a bundle, so you can opt for those if you want to save more money. This depends on what you intend to use the air pump for. Some air pumps are suited for different sizes of tanks, but the sizes are only relevant if you intend to use the air pump to operate an undergravel filter. If you’re using the air pump for decorative purposes, then the more ornaments you run using the air pump, the larger it has to be. Similarly, if you’re only running a few ornaments, then a smaller air pump would do the trick. You should also consider air resistance. If you are using decorations in your tank that resist the air coming from the pump, then you might need a larger air pump. Note that larger air stones may also provide higher resistance compared to small air stones. Additionally, if your tank is more than 20 inches high , you might need to get an air pump that is meant for deep water so that air can still be pushed far below the water surface. To help you decide on which air pump to buy, we’ve listed up some of the top-rated air pumps below, along with our reviews for each product. With two outlets and various accessories, this 4-watt pump is ideal for tanks that contain 60 to 400 liters of water. It comes with a 6 feet power supply cable, 2 return valves, 2 air stones, 2 M airlines, and 2 connectors. It has a voltage of 110 to 120V 50/60Hz, and provides pressure of up to 0.016Mpa. The airlines come in the standard 4mm internal diameter. The air pump itself is measured at 129x71x63mm. It has most of the accessories you might need. Affordable price considering the accessories it comes with. Has a low sound, described to be similar to that of a ticking watch or the sound of rustling leaves. Warranty is available, but for an unknown period of time. Lacks power and may not be good enough for bigger fish tanks. Known as a “back-up” air pump, this battery-operated pump is ideal for situations wherein your main air pump fails to deliver. Whether it broke or you just had a power outage, having a battery-operated air pump is a good idea to have a reliable air source for your fish. At 6.2 ounces, this air pump is measured at 1.5x2.5x5 inches. This makes it very easy to carry around. 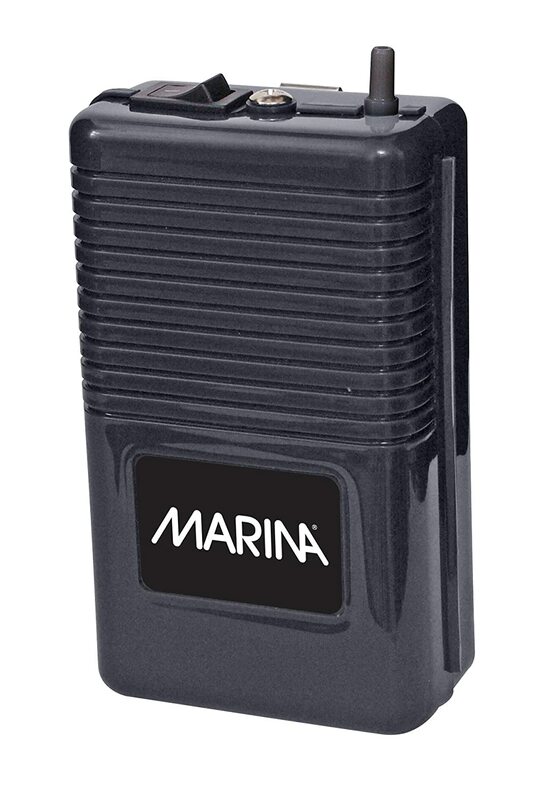 Battery-operated and can be relied on during power outages Ideal when you’re in transit or during fishing. Comes with air stone and 18-inch tubing. Might not be the best option to use as your main air pump as buying and replacing batteries can be more costly. Makes more noise compared to other air pumps. Requires 2 D-cell batteries in parallel, a setup in which one cell will always discharge the other over time. It’s advisable not to leave the batteries in the unit when not in use. This pump is designed for deep tanks with significant back pressure. It can pump air down to 8 feet. It comes in seven sizes, starting from the smallest that can handle up to 10 gallons, to the largest, which can handle up to 300 gallons. Despite being a powerful air pump, it is still known to be a quiet one, that is why it is called “Whisper”. 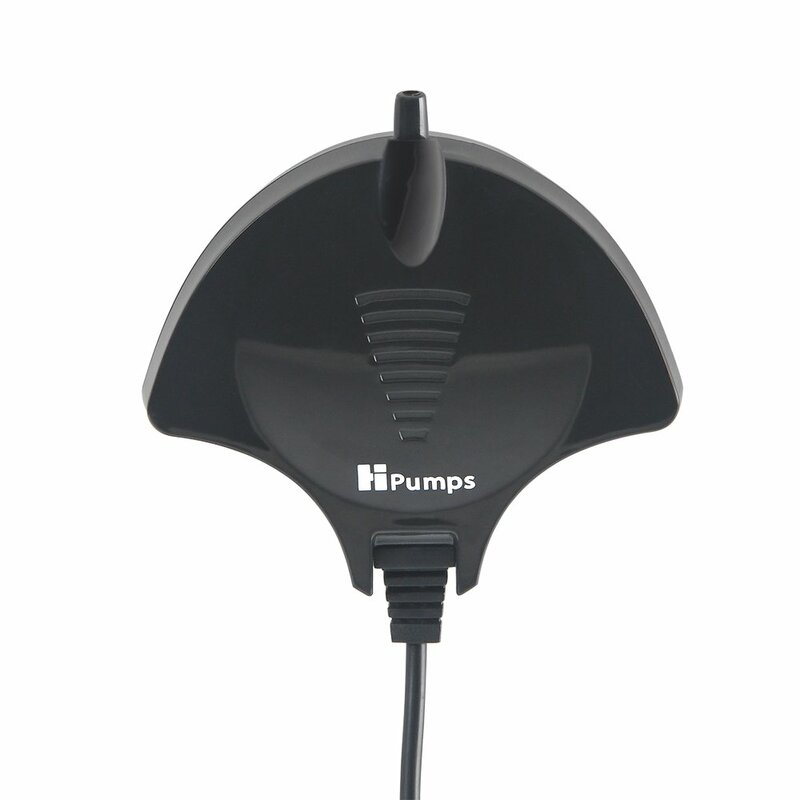 At only 8 ounces and 3.5 watts, this small but highly capable pump provides versatility. Has a unique dome-shaped design that minimizes noise and turbulence. Availability of pumps for various sizes of aquariums, which makes this pump a great choice regardless of your tank’s size. Comes with a free program called TetraCare, where you can ask for online and over-the-phone support. They also send emails containing aquarium tips and guides for the first six months since purchase. Warranty does not cover rubber parts such as flappers, diaphragms, and isolators, which are parts that may fail on a pump. This AC/DC battery-operated air pump automatically switches to battery backup when power outages occur and recharge once power has been restored. It comes with two output ports and an impact-resistant design. It can pump air continuously for 14 hours on a full battery. There are also interval modes that can extend the battery life for up to 28 hours. Despite the strong batteries, it only weighs 0.3 ounces. Reliable; continuous operation even when there is a power outage due to backup battery extension. Has impact-resistant design, which makes it more durable. Warranty is available, but for an unknown duration. Great only for smaller tanks up to 50 gallons due to lack of power. More expensive compared to other air pumps that has higher capacity. This energy-saving air pump is driven by a thin piezoelectric ceramic plate, making it different from traditional electromagnetic air pumps. It doesn’t contain EMI, a motor, or a shaft, so it’s lightweight, silent and highly durable. It also comes with multiple accessories. The installation process is simple and so this pump is ideal for beginners. It has a unique shape and design that can add aesthetic appeal to your aquarium. Comes with an air stone, an airline, a suction cup, and a user manual. Easy to install and is lightweight so it can be attached to the outer glass of your tank using the suction cup. Unique design and system that makes little noise. Warranty is available for an unknown duration. Only suitable for smaller aquariums with up to 20 gallons. It’s been a close fight between the Deep Blue Professional Air Pump and the Tetra Whisper Air Pump. While the Deep Blue Professional’s rechargeable backup battery is an amazing feature, we think the Tetra Whisper’s support availability and wide range is awesome too! Ultimately, the winner would have to be the Tetra Whisper Air Pump. One of the things you have to consider when getting an air pump, especially when you’re using undergravel or corner filters, is the capacity of the pump. 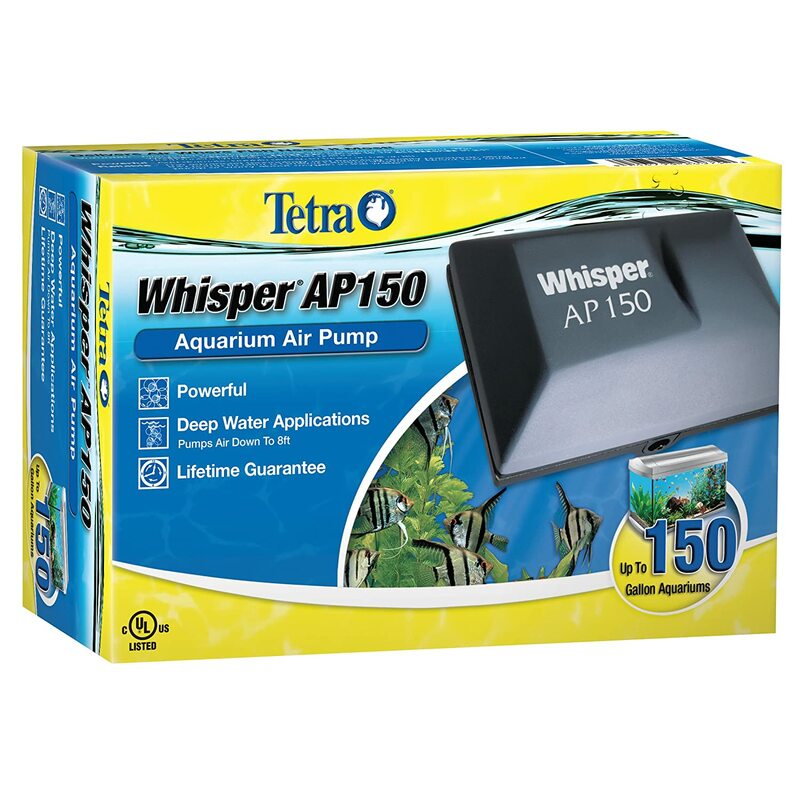 The Tetra Whisper Air Pump has multiple options that can accommodate from 10 gallons up to 300 gallons.